Plus Size Kitten: Seventeen Magazine Origins Zero Oil Workshop! Check out the latest issue of Seventeen Magazine (September)! 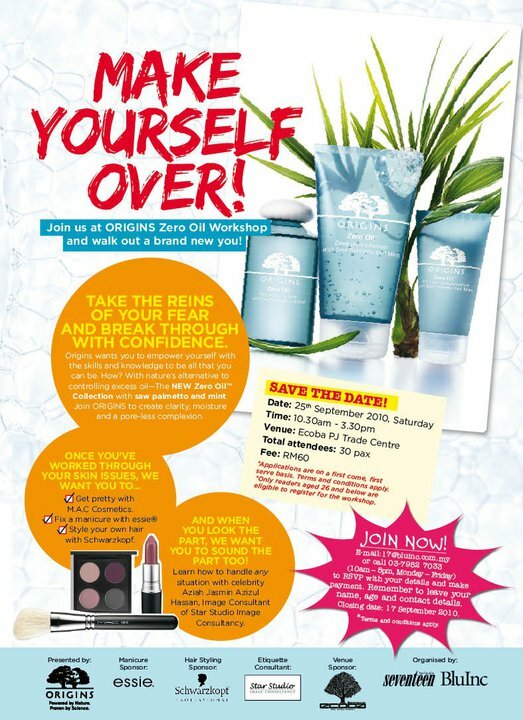 There's a Origin's Zero Oil workshop for Seventeen readers of the age of 26 and below only! How cool is this? I really like Seventeen Magazine parties n workshops! too bad that I am not seventeen anymore T_T but I have always been a big die hard fan of the magazine when I was young till now! What to expect from this workshop: Get pretty with MAC Cosmetics, Fix a manicure with Essie! Style your own hair with Schwarzkopf! Learn how to handle any situation with celebrity Aziah Jasmin Azizul Hassan, Image Consultant of Star Studio Image Consultancy. Join Now! Email: 17@bluinc.com.my or call 03-79527033 (1am-5pm Mon-Fri) to RSVP your details and make payment. Remember to leave your name, age and contact details. Closing date 17/9/10. Terms and Conditions apply. tutu u today no workin ka..can suddenly comment blog one..
Yumi: this workshop is made for u leh.. 17year old ppl! :) u call up n register only. 17 this year, is still 17! would really like to go for an origins workshop though..